Universal Studios is going all-out this year for its annual Halloween Horror Nights scare fest. Park officials recently announced three all-new scarezones uniquely designed to inspire pure, unadulterated fear in park visitors: Dracula Untold, The Purge: Anarchy and Alien vs. Predator. 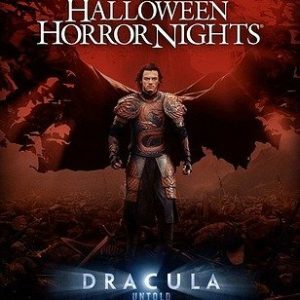 “Dracula Untold: Reign of Blood” will introduce guests to the sadistic Transylvanian ruler Vlad Tepes, known as “Vlad the Impaler,” on whom the Dracula character was based. Tepes, a one-time hero turned bloodthirsty tyrant, was known for his cruel practice of impaling his enemies on wooden stakes as a deterrent to other invading armies. At the new maze, visitors will first pass through the frightening cave from which Dracula first emerged. Next, they make their way through a destroyed village and into the woods on the way to Dracula’s foreboding castle, in which each room contains scenes designed to highlight Vlad’s transition from a mortal into Dracula. At the conclusion, guests come face-to-face with the victims of Dracula’s torturous practices. Although each turn in the all-new scarezone depicts a horrifying experience straight out of the upcoming film, it’s said to be more of a living preview than a movie spoiler. So if you’re planning to see the action-adventure film, don’t hesitate to experience the fear firsthand! “Dracula Untold” is scheduled to be released in October. 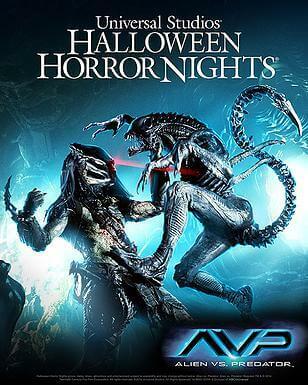 Universal Studios will serve up a double dose of horrifying beasts with a haunted house based on the AVP: Alien vs. Predator franchise at this year’s Halloween Horror nights. Danger lurks at every turn in the horrifying new labyrinth designed to put you right in the middle of the ancient battle between aliens and predators. The scare zone puts guests inside a research facility that deals with extraterrestrial technologies. Communication has been lost. Security has been compromised. And vicious Xenomorphs (the Aliens) are loose inside and on the hunt. This year marks the 10th anniversary of the “Aliens vs. Predator” film and the 35th anniversary of the original “Alien” film. Inspired by Universal Pictures’ latest box-office horror success, the all-new scarezone will place guests at the core of unimaginable horror: A familiar emergency broadcast sounds, signaling that for the next 12 hours, all crime, including murder, is legal. Average citizens, your neighbors and friends, will transform into sadistic masked felons with brutal intent, leaving you scrambling to “survive” the scare. 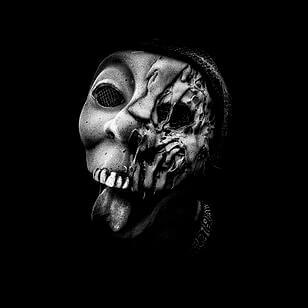 The Purge scarezone will invade the streets of Halloween Horror Nights, taking up the majority of the “New York” back lot, and the chaos will repeat on a nightly basis throughout the event.